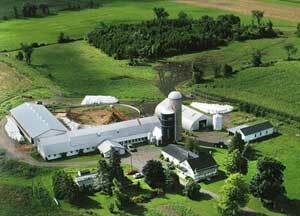 Mapleley Holsteins was founded in 1969 when Alfred and Norma Latulipe became Holstein Canada members with two registered females. Good proven bulls were used, and re-used at Mapleley Holsteins if successful in the breeding program. Of their three children, Steven, Linda, and Julie, all remain active on dairy farms, Linda on Ferme Lolisée in Chatham Quebec and Julie at Breeze-hill in Winchester Ontario. In 2001 Mapleley Holsteins was awarded the Master Breeder Sheild from Holstein Canada. Contributing over one-third of the shield points is the Armhurst Raven Sylvia family with most notable offspring, Mapleley Starbuck Lucy (EX-6E 3*). Another 25 percent of points come from Greenlark Citation Patsy (VG 2*). Reserve All-Québec in '95, Mapleley Chief Mark Bonus (2E 4*) is an example of a tremendously-uddered offspring from Patsy. The first EX Red Marker daughter in Canada, Mapleley Red Marker Justine (EX) traces to the third herd matriarch, Strathburn Senator Judy (VG). Brazil has been the recipient of Mapleley's best show winners, as well as Argentina and the US. In 2005 Steven Purchased the Majority shares from Alfred and Julie. Following the purchase modernization of the old dairy barn, atomization of all the feeding and the construction of a cold heifer barn was completed. 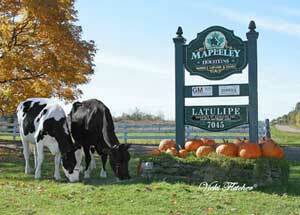 For more details on the Mapleley story see the Holstein Journal Article dated March 2002.